The joint NASA/ESA Cassini-Huygens mission made some interesting discoveries on Jupiter, on the way to its final destination which was Saturn. 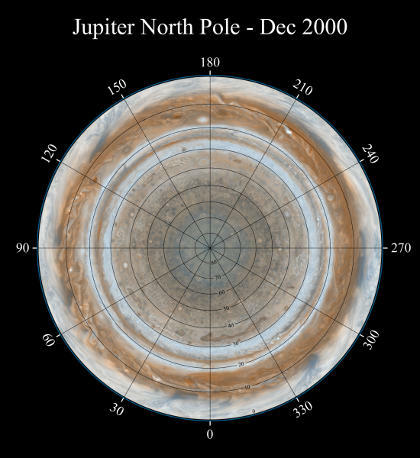 This January 2001 composite infrared picture shows Jupiter’s south pole (left) and north pole (right). The bright green spots are the warmer areas, believed to be organic matter, specifically acetylene (ethyne; C2H2). This research allowed scientists to better understand the chemical interactions between sunlight and molecules in Jupiter’s stratosphere. 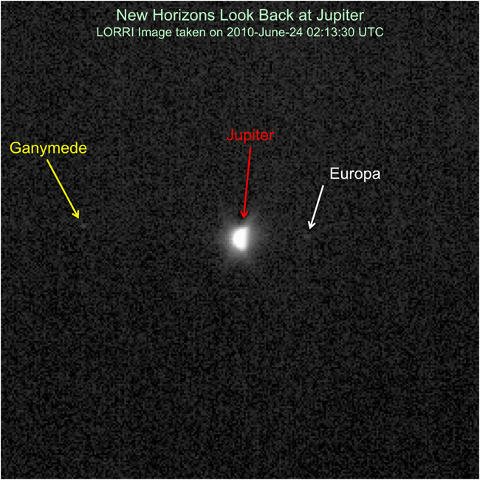 NASA’s New Horizons probe looked back to take a picture of Jupiter while on the way to accomplish its Pluto-Kuiper Belt mission. This picture was taken by the space probe’s Long Range Reconnaissance Imager (LORRI) when it was about 1.5 billion miles from Jupiter. The giant planet can be seen as a half/partial phase and two of its moons, Ganymede and Europa, are barely visible in this nine millisecond exposure. Jupiter is an amazing planet with sixty seven (as of 2014) confirmed moons. Callisto is one of its larger natural satellites, in fact bigger in size than the planet Mercury. 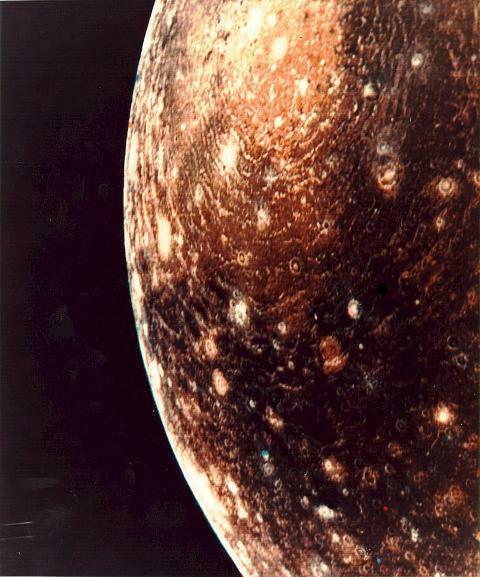 NASA’s Voyager probe was sent to explore Jupiter and some of its moons and took this picture of Callisto in 1979. The bright portion is believed to be an impact crater about 600 km across. Callisto was discovered by Galileo Galilei in 1610 and over time it has been determined that Callisto is mostly composed of rock and ices (water and ammonia frozen in ice form due to extreme temperatures of about 120 degrees Kelvin or -243.67 degrees Fahrenheit at its equator).